Researchers from FOM Institute AMOLF and the California Institute of Technology (Caltech) have discovered a new method to generate electrical potentials using light. Using precisely sculpted metal nanocircuits they could effectively capture and convert light into an electrical potential of hundred millivolts. The research was published at the end of 2014 in the journal Science. Small particles of precious metals such as copper, silver and gold are known for the colourful spectra they produce when illuminated with light. Stained glass windows in old churches are a well-known example of this. Small metal particles in the glass are responsible for the colours. 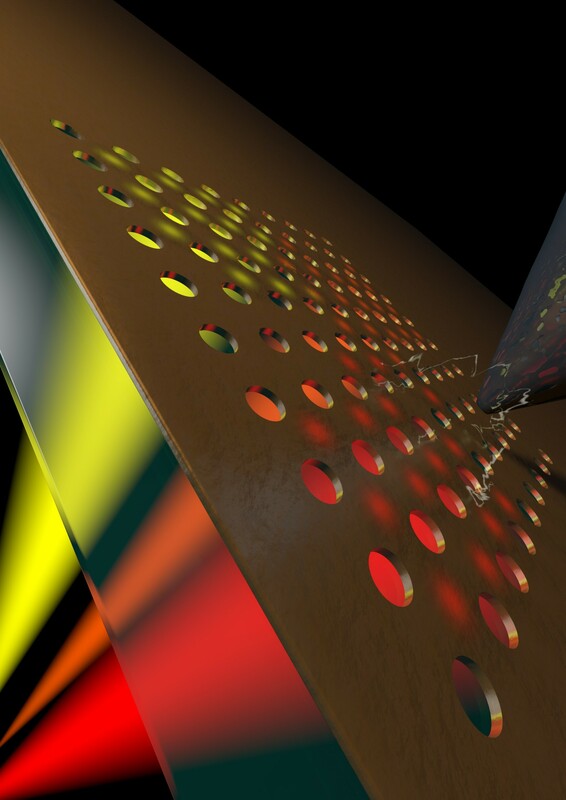 The light that shines on these particles is converted into plasmons, oscillations of the free electrons in the metal. The oscillations lead to a strong absorption and scattering of certain colours of light. The Dutch-American team of scientists investigated the light absorption process in artificially created metal nanocircuits. They made the circuits using modern cleanroom techniques. The circuits are composed from a square array with 100-nanometre-diameter holes in a gold film only 20 nm thick. Just like the nanoparticles in the stained glass windows the grating exhibits clear plasmon resonances. The distance between the holes determines the colour. The researchers irradiated the nanocircuits with a laser. This allowed the colour of the light to be gradually changed from blue to red. This first of all gave rise to a negative voltage (-100 mV) for the blue light and subsequently a positive voltage (+100 mV) for the red light. The voltage was measured using an ultrasensitive needle positioned just above the illuminated circuit. The researchers subsequently developed a thermodynamic model that accurately described the phenomena measured. The incident light causes small temperature variations that provide a thermodynamic driving force for the exchange of electrical charges on the switch. That leads to the voltage measured. The new mechanism can be used to power electrical nanocircuits using light. In addition, the scientists are investigating whether this new mechanism can be used to generate energy from sunlight. Artist's impression of the plasmoelectric effect. If a gold film with nano-holes is irradiated with light, an electric potential is created. A sharp needle (top right) measures this potential. The voltage measured is negative for blue light and positive for red light.